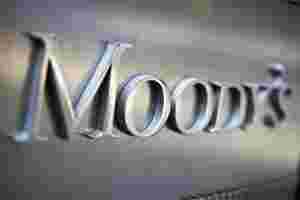 New York: Credit rating company Moody’s Corp beat analysts’ estimates even as profit fell on a drop in corporate bond issues amid government debt crises in Europe. Earnings per share were 57 cents. Analysts, on average, had estimated the company earned 49 cents per share, according to a survey by Thomson Reuters I/B/E/S. Earnings per share a year earlier were 58 cents. Outstanding shares declined 5% from a year earlier to 222 million on 30 September as the company bought back stock. In the third quarter, Moody’s repurchased 6.8 million shares after buying back none in the second quarter. The company affirmed its prior forecast for full-year earnings per share, but added that it expects final results to be “at the upper end" of the range of $2.38 to $2.48. Chief executive Raymond McDaniel said in a statement the company affirmed the full-year forecast “though volatile market conditions in the US and Europe may continue." Corporate bond rating revenue was down 11% from the year-earlier quarter, the company said.